Map of the Commonwealth realms - independent countries which share the British monarchy. Current realms in dark blue, former realms in light blue. By Evan Centanni, modified from public domain Wikipedia map (source). Which countries share the Queen? 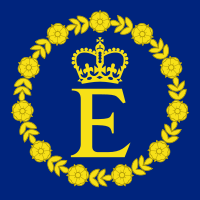 Personal flag of Queen Elizabeth II (source) License: CC BY-SA. Just as the sun never sets in the British Empire, the monarchy never set in the realms - each one inherits the queen's role from its time as a former British colony (with the exception of northern Papua New Guinea, which passed directly from German to Australian control before uniting with the British south in independence). Sixteen countries - is that all? Although the independent realms total 16, the number of "countries" with Elizabeth II as their queen actually increases to 19 when including the four "home nations" that make up the U.K.: England, Scotland, Wales, and Northern Ireland. But that's not all - as if 16 realms weren't enough for one woman, the Queen of England also reigns over three Crown Dependencies (Guernsey and Jersey in the Channel Islands, plus the Isle of Man) and the 14 British Overseas Territories, all of which are dependent on the U.K., but aren't considered part of the kingdom itself. And interestingly, the Realm of New Zealand includes two associated states, the Cook Islands and Niue, which could remain royal subjects even if New Zealand itself were to fire the queen from its government. Entire reign of Queen Elizabeth II (1952-2012). Current in red, former in blue (dark = sovereign realm; light = territory or dependency). Click to enlarge. Excludes Antarctic claims. By Evan Centanni, from public domain map (source). Historically, there are about 20 more countries which were Commonwealth realms during parts of the last Century, but have since abandoned the monarchy to become republics. Still, the current list is longer than it used to be - at the time of Queen Elizabeth II's coronation in 1952, there were only seven realms: the U.K., Australia, Canada, New Zealand, Pakistan, South Africa, and Ceylon (now Sri Lanka). How can countries share the same monarch and still be sovereign states? Every one of the Commonwealth realms is a fully-fledged independent country and a member of the U.N., despite sharing the same queen. So how does that work? Each country has separately and independently designated Elizabeth II (and her royal line) as its head of state, and the British parliament has no authority whatsoever over the governments of any of the other realms. In a certain legal sense, these 16 countries just happen to have chosen the same family to form their monarchy. To show this independence, each realm calls the queen by its own national title - she is not only the the Queen of England, but the Queen of Australia, the Queen of Canada, the Queen of the Bahamas, etc. As for Her Majesty, she's been said to be "equally at home in all of her realms". But since she has only has one physical body, she still mainly lives in the oldest realm: the U.K. In her other countries, she's represented on an everyday basis by appointed viceroys (the highest-level viceroys are called governors-general). But if they're all controlled by the same person, isn't that like being one country? 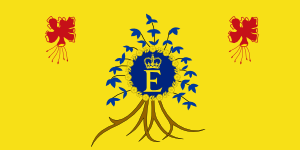 Flag of Elizabeth II, Queen of Barbados. See all flags of Elizabeth II. By Barryob (source). License: CC BY-SA. Unlike in medieval personal unions, where a single monarch had power over two or more countries, the queen has next to no power in her modern realms. Although there are some decision-making powers ceremonially assigned to her, for the most part she can now only exercise them if asked to by the country's government. Since modern constitutional monarchies require the royal family to stay out of politics, the queen serves as a symbol of a loyalty to one's nation that transcends political differences. Still, this must create some awkward situations now and then, right? Absolutely - since the queen mainly acts only on the "advice" of her countries' governments, she officially takes both sides whenever two realms disagree, and has also been found engaging in trade competition with herself. She may also be simultaneously neutral and at war when one realm is involved in an international conflict and others are not; in extreme cases, the monarch of the Commonwealth realms may even declare war against him or herself, as happened in the Indo-Pakistani War of 1947 (during the reign of King George VI). Learn More: The Commonwealth of Nations includes a lot more than just the Realms - so what is it, exactly?